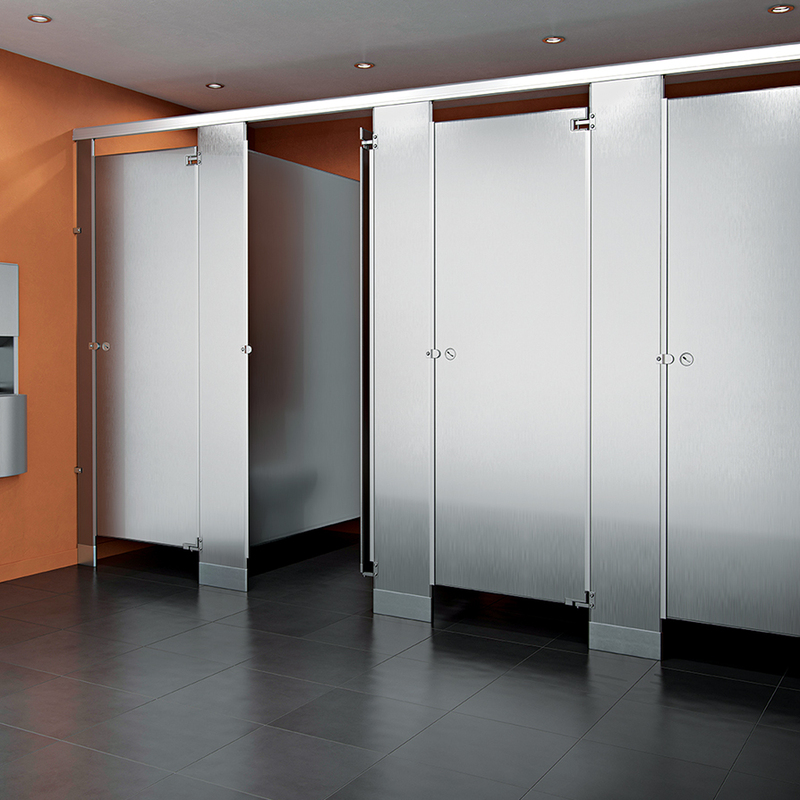 Accurate bathroom stalls are available in a variety of materials including powder coated steel, stainless steel, solid plastic, solid phenolic, and plastic laminate. Accurate toilet partitions may be mounted as floor anchored with overhead braced installation, ceiling hung, floor anchored, or floor to ceiling anchored. Accurate toilet partitions are available in a variety of color options and orders ship within 48 hours. If you are looking to renovate an existing bathroom, or start a new bathroom construction project, we can help with the material selection process, layout, design and pricing. Accurate Partitions Corporation was founded in 1957 as a division of U.S. Gypsum. Under the U.S. Gypsum umbrella they had steady growth until they were sold to ITR Industries, a privately held company, in 1984. ITR was already in the construction products business and owned American Specialties, Watrous and ASI Storage Solutions. Today Accurate Partitions Corporation operates manufacturing plants in Chicago, IL and Toccoa, GA. They are one of the largest and most successful toilet partition manufacturers in the world. Accurate Partitions Corporation currently manufactures Powder Coated Steel, Stainless Steel, Solid Plastic, Plastic Laminate, Phenolic Color Thru and Phenolic Black Core restroom stalls. Powder Coated Steel Toilet Partitions – Accurate Partitions Corporation pioneered the use of powder coated steel toilet partitions, which have become the standard for durable quality at an affordable price. The finish is resistant to wear, fading and scuffing. It is easily cleaned with a mild soap solution and wiped dry. The hybrid epoxy/polyester powder is electrostatically applied for uniform thickness over cold-rolled commercial quality (CRCQ) galvannealed, stretcher-leveled steel. The core is made of cellular honeycomb for solid construction and sound attenuation. It is bonded to the formed steel with a non-toxic adhesive and locked in place with a roll formed molding and brazed corners. Powder Coated Steel is the least expensive of all the options. Stainless Steel Toilet – Accurate’s stainless steel toilet partitions are virtually indestructible and retain their gleaming beauty indefinitely. These units combine the strength of #304 stainless steel with a #4 satin finish or textured finish, formed and bonded to a honeycomb core. The face sheets are held rigid and permanently in place by an interlocking strip welded at each corner. Stainless steel components are impervious to just about any substance. Even scratches caused by deliberate vandalism can be removed by buffing. The elegance of their stainless steel components complements any design scheme, either in new construction or for renovations. Stainless Steel is the most expensive material available, but it is also the most aesthetically pleasing. HDPE Toilet Partitions – Solid Plastic partitions are manufactured of high-density polyethylene (HDPE) resins with same color throughout and smooth, machined edges. The aluminum heat sink strip at bottom edges of doors and panels is a standard construction feature. They are designed for high-traffic public facilities, parks and schools. Solid Plastic is the material of choice where low maintenance and durability are required. Its lightly textured finish hides the effect of vandalism. Solid Plastic is attractive as well as environmentally safe and sanitary. It is completely water resistant, unaffected by steam, high humidity and corrosive environments. It is mildew, rust, graffiti and impact resistant. Commercial cleaning agents may be used without fear of damaging the surface. Most colors are available in 100% post-consumer recycled material. Plastic Laminate Toilet Partitions – Accurate’s plastic laminate partitions are constructed of high-pressure, 0.050" vertical-grade laminate finishes, bonded under pressure to a solid impact-resistant particle board core, and meet or exceed all NEMA standards. Edge banding of all components prior to face lamination ensures optimum water runoff and durability. Plastic laminate partitions are available in all four mounting styles and a variety of designer colors to complement tile, vanities and counter tops. They are the finish of choice for commercial and institutional installations where aesthetics are essential and cost is a consideration. Black Core Phenolic Toilet Partitions – These partitions are decoratively faced on both sides of a resin-impregnated Kraft paper core. The surface and core sheets are fused at high temperature and pressure. In addition to strength and serviceability, a wide range of colors provides limitless design flexibility. Both Black and Color-Thru are the same product, but the color thru uses resin and Kraft paper that match the surface color. Color-Thru Phenolic Toilet Partitions – The Color-Thru Phenolic is made with surface color throughout the partition. With all the advantages of traditional Phenolic performance, it’s especially effective when gouging and vandalism are an issue. This material is less expensive then Stainless Steel, but more expensive than Powder Coated Steel, Solid Plastic and Plastic Laminate. In late 2000 Accurate Partition Corporation came out with design software. Before the software, everything was laid out on graph paper, with measurements written on the margin. The first version was incomplete and slow, but it was able to show the customers exactly what they were ordering. Today when we quote a restroom stall job, one of the main pieces is your set of drawings. The drawings tell you exactly were everything goes, and all of the sizes of the panel, doors, and pilasters. In today’s culture, everyone is concerned about the environment and recycling. Accurate Partitions were one of the first to meet LEED 3.0 Certification. Their powder coated steel has 54% Post Consumer and 27% Post Industrial content. They use only low VOC adhesives and paints. The Metal Partitions, Powder Coated Steel, and Stainless Steel, ship from Chicago, Illinois while the Plastic Partitions will ship from Taccoa, Georgia. Most of the Accurate toilet partitions ship within 48 hours of order.